Private Adult or Children’s Cooking Class 2 or more people. I will teach you how to make 2 items. $40.00 per person. One person $60 each additional person add $20.00. Nutritional Health and Life Coaching $75 for a 1 hour session for 1 person. Private sessions designed just for you. Thyroid Management – 4 classes – $100 per person for all 4 classes. I explain the best foods to avoid and the best foods to eat to manage your thyroid. It’s not just about the food. Inflammation – $75 1 class for a little over an hour. I explain the best foods to eat and to avoid to reduce or eliminate inflammation in your body. 3 Day Detox Cleanse $50 for a Private Class or $30 per person for 2 people each additional person $25 per person. Personal Chef – Meals prepared for 1 or family size trays – Most meals are $25 each for one person or $45 to $65 for a family size tray. Personal Chef Catering up to 30 people – $ depends on the menu. Cooking Classes for Adults or Children (Group) – Children’s Group Classes on Saturdays at 1:00 $30 per class or $100 for 4 classes. Adults 2 or more people $50 per person. 4 or more classes $40 per person. Mommy and Me Cooking Classes (Daddy, Nana, Grandpa, Grandpa, Aunt…) $80 per class for the Adult and child together. 3 classes $180. 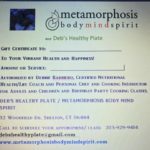 Email me at debshealthyplate@gmail.com, Private Message me on Facebook or call 203-929-9414. You can pick up the Gift Certificate from me or I can email it to you as an attachment after you have paid. I will fill it in with the name of the person and what service it is for. You can also purchase a Gift Certificate and let them decide what they would like to use it for.